SUSPENSE SISTERS: Today we welcome debut author, Sharee Stover, along with a giveaway! Today we welcome debut author, Sharee Stover, along with a giveaway! Introducing a debut suspense author is always a pleasure on Suspense Sisters. Here's a bit of bio about Sharee Stover and her brand new book, Secret Past, from Love Inspired. Colorado native Sharee Stover lives in Nebraska with her real-life-hero husband, three too-good-to-be-true children, and two ridiculously spoiled dogs. A self-proclaimed word nerd, she loves the power of the written word to ignite, transform, and restore. Her Christian romantic suspense stories combine heart-racing, nail-biting suspense and the delight of falling in love all in one. 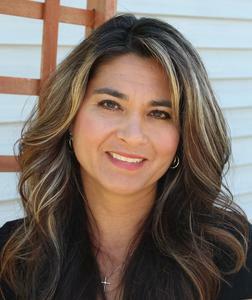 She is a member of American Christian Fiction Writers, Romance Writers of America and Nebraska Writer’s Guild. Sharee is a two-time Daphne du Maurier finalist and the winner of the 2017 Wisconsin Fabulous Five Silver Quill Award. When she isn’t writing, she enjoys reading, crocheting and long walks with her obnoxiously lovable German Shepherd. I’m a devoted wife and mother passionate about Jesus with a serious writing obsession. I love to crochet but have to stick to things that are flat and don’t require any assembly since I can rarely make two things the same size. Granny square anything doesn’t work for me. Therefore, I stick to blankets. I love to read anything from historical to thriller and when I have time, enjoy paper crafts like cardmaking and scrapbooking. Island of the Blue Dolphins and The Secret Garden. But I can distinctly remember devouring everything written by Judy Blume and Beverly Cleary. I love Christian hard rock bands like Disciple, Thousand Foot Krutch and Skillet and enjoy attending their live concerts with my family. I am a two-time cornea transplant recipient and grateful every single day for my sight. I love Korean food, especially kimchi. I started out writing suspense and it morphed into romantic suspense. I never thought I’d write romance and some days, it still surprises me. I also wanted to write historical, but that book is collecting dust. Maybe I’ll go back to it sometime in the future. The toughest criticism was being told an agent hated my heroine. I had to completely revamp the character. The best compliment was having a reader say she felt like she was watching TV because she could “see” the scenes in my book. I’d love to try writing mysteries too. I think it’s especially challenging to keep the book going with the who-done-it to be seen. I would have read every book on writing right away. I’ve learned a ton through conferences and reading craft books but much of it came after the fact. Don’t give up. There are days when I’d think I was the biggest fraud pretending to be a writer. If you’re writing, you are a writer with or without a published book. Tell us about your debut release, Secret Past, which sounds like my cup of tea! She’s not who she thinks she is...with gunmen at her doorstep, Katie Tribani learns her true identity. She’s been in witness protection since childhood, and now her crime-lord father has found her. As bullets fly, US marshal Daniel Knight whisks her to safety—but not for long. Captured and held prisoner, only Katie can unearth her secret past…if she can survive long enough. Congratulations on the release of SECRET PAST, Sharee! Excited to see where your future takes you! And...I learned some new things about you. A two-time cornea transplant? Wow! We don't realize how much we take for granted. So happy God restored your vision! Oh, and my niece loves kimchi. She eats it like candy! SECRET PAST sounds like a nail-biter. Hidden identities always intrigue. Well done! I received both transplants on Veterans Day a year apart. Isn't the crazy? But yes, I do not take vision for granted that's for sure. Congratulations on your debut book, Sharee! And I echo Cynthia - as a two time cornea recipient you show us why the gift of life is so important in the midst of sorrow. I love your book! What gave you the spark of the idea for it? Congrats on the release of your book! Sounds like a great read. Mindy, thank you for being here! You're in the drawing and I hope you enjoy Secret Past! Great meeting you. Congrats on your release. Hi Beverly! Thank you so much. I'm so glad we could "meet" this way! :) I've got you in for the drawing. I love suspense. This looks really good. Naomi, yay for Suspense! Thanks for being here! I've got your name in for the drawing and hope you like the story! Congratulations on your book, Sharee! What a great interview - you are an interesting lady! Giggle, Laura..."interesting" is definitely a way to describe me :) Thank you so much for swinging by! I loved learning more about you. Can't wait to read your book, Sharee. And I LOVE that cover. Congratulations on all the exciting stuff happening. Your hard work and dedication is paying off! I had the honor Of reading and ARC of this and would love an autographed copy. Hi Linda! Thank you so much for reading the ARC and you're definitely in the drawing! Sharee is one of the sweetest people I know. So much fun and always smiling. 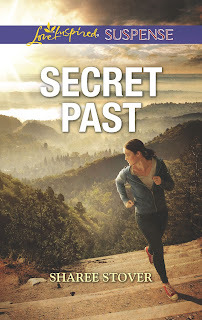 I loved Secret Past and think romantic suspense readers will enjoy it too. Sharee, what a great interview. Congratulations on your debut release. (Please don't enter me in the drawing - I'm fortunate to be reading the book now - I'm at about the 25% mark). That's for your honesty and your straightforward manner. Your happiness and gratefulness shine through. Tanya welcome! I hope you enjoy the story! Isn't there something fun about seeing the percentage move along on an ebook? I don't know why that's so fascinating to me :) Like a tiny cheering section right there on your Kindle. Sharee, Congratulations on your debut release! Suspense stories are my favorite! Children and dogs, when do you find time to write! I also am a crocheter, flat items only for sure! Hello Helen! I love it, fellow flat crocheters unite! :) I can't tell you how many granny square blankets I tried before I admitted I could not make the same size stitch EVER. I agree! The Love Inspired Books are wonderful. Congrats to whomever wins a copy of SECRET PAST. I was blessed to receive a review copy (my review is on Goodreads). A fabulous first novel for Sharee! Sharee, I loved learning new things about you in this interview! Hi Karen!! Thank you so much for being here and for your review. Hi Judy! You’re in the drawing. Hope you enjoy the story. Sharee, it’s fun to learn more about you through this interview. Island of the Blue Dolphins?!?! I have an autographed copy! I’m so excited to read your debut. Congratulations and blessings on your career as an author! Sharee, such a fun interview! I loved be the premise of your story and I’m uber excited to read it. And you’re no fraud - you’re an awesome author. Hi Terri!! Big hugs to you!! Thank you! Island of the Blue Dolphin was also a favorite of mine. Your book looks great. Thank you for the chance to win a copy. Hi Susan, isn't it funny of all the books I've read that one sticks out in my mind? You're in the drawing! Congratulations Sharee on the publication of your debut novel. I am a fan of mystery/suspense and LI suspense books are always great! Connie, thank you for being here and blessings to you too!! I love mystery/suspense books and can't read enough of them. Great interview Sharee! I look forward to reading your book. I also was born in Colorado and still live in the Midwest (Minnesota now). I can't imagine what you went through with needing corneal transplants. Thank you for sharing and for the opportunity to win. Hi five to a fellow Coloradan gone Midwestern! :) Maybe someday I'll do a transplant story too :) Thanks for being here! This seems like a very interesting premise! I love suspense. I remember reading Island of the Blue Dolphin! Hubby learned to like Kimchee when we were stationed on Guam. My kids like it , me not so much. I crochet but would rather sew and bead for jewelry. We lived in Wisconsin for 11 years! 75 miles north of Green Bay! What part did you live in? Hoping to win! paulams49ATsbcglobalDOTnet Thanks. Paula, how fun that so many of us loved Island of the Blue Dolphins! I don't get kimchi much where I live but when I go back to Colorado, I take a cooler so I can bring some home. My husband hates the stuff. Giggle. You really either love it or hate it. I haven't known many people who are in between. I'm actually in Nebraska and never been to Wisconsin but would love to go! Especially to the Writers Police Academy! You're in the drawing! Congratulations on your book Sharee! I also completely devoured books by Beverly Cleary and Judy Blume. I go to a lot of live concerts. I haven't seen Thousand Foot Krutch yet, but I have seen Skillet and Disciple several times. Have you seen Red? I think you'd like them. Thank you for the giveaway opportunity too. I love the Love Inspired Suspense line! Thank you for the encouragement for us dreaming writers too! Hi Kelly! I haven't seen Red live but I do like their music. We got to meet Disciple a few years back and they were all so gracious and kind. It was one of the best shows I've seen. Never give up the dream! Congratulations on your debut novel! It sounds wonderful! I loved getting to know you. What really caught my eye is the cornea transplants. God is so good! I love the way He has helped man figure out how to do amazing things like this. I'm heading to Amazon, and everywhere else I can think of, to follow you. Thanks for the chance to win a copy of your book. Debbie, thank you! Yes please! I'd love your follows and please join my newsletter too. I'll be giving some behind the scenes things away next issue! Donna, thank you so much for reading the Love Inspired books and for being here! I love meeting new authors. Sharee's book sounds like a real page turner that I would enjoy reading. Maryann, thank you for being here! I so hope you enjoy Secret Past! Secret past sounds like an exciting read. Thanks for the chance! Hi Linda, thank you for stopping by! I hope you enjoy Secret Past! Love to learn about new authors, especially in the genre that I enjoy reading. Congrats on your book Sharee. Secret Past is an excellent read. Keep up the wonderful writing Sharee. I enjoy learning about new authors and your debut book sounds very interesting. How weird would it be to learn you’re not who you thought you were. Besides reading I also enjoy crocheting. I do simple most of the time too. I giveaway most everything I make. I have pain in my right wrist and elbow sometimes when I crochet so I have to take breaks every now and then. Congratulations on your debut novoel. I'm sure there's plenty more to come. I love writing myself and gave a great agent so am hopeful. Congratulations on your debut book! It sounds like something I would really enjoy reading! Would love to win a copy! Thanks for the opportunity! Your book looks very good. Thanks for the chance at the giveaway. Sharee, congrats on your debut book! LIS is among my top favorite of the Love Inspired line & this one sounds good! Thank you for the chance to win a copy. Susan Sleeman Interview and Kill Shot Giveaway!